Happy Wednesday! I am a day late on this post, sorry about that! I didn't get to do my nail art until late last night. I was sorting through my photos and noticed it was nearly 1 AM, since I had to be up at 4:45, I decided I better quit and go to bed. LOL So, I'm a bit late, but better late than never! Hopefully I can still get today's done on time and posted later today. Moving on, I am pretty happy with how today's nail art turned out! I did a "four seasons" look, more about that below! For this design I had in my mind the four seasons as they would look if you were standing on the ground and looking up through trees. Living in Arizona, I don't have four seasons and it is something I really crave. It's already been in the 90s here a few times this year. I know that probably sounds appealing to those of you buried in snow right now. But when it starts getting that warm this early in the year, then regularly hits triple digits from May through August or September, then is still in the 90s until October or November, it gets old! 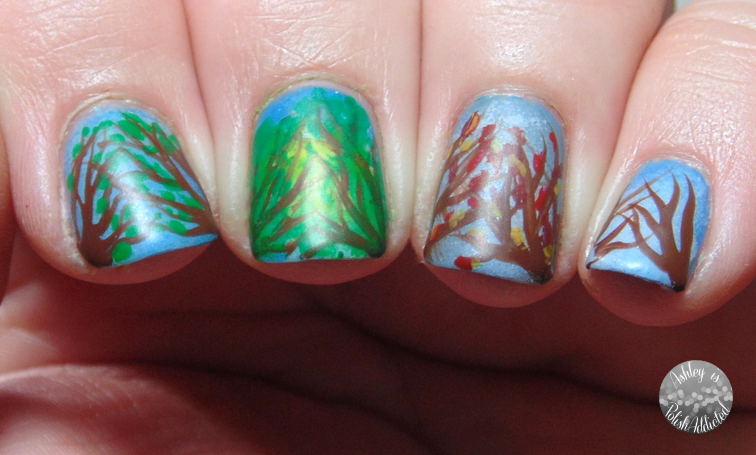 I hope someday I can live somewhere where the seasons actually change and are reminiscent of what I created on my nails. I have Spring on my index nail - bright and cheery sky with buds on the branches; Summer on my middle nail, super bright and sunny with leaves everywhere; Autumn on my ring finger - cloudy sky with leaves changing color and sparse; and finally, my pinkie and thumb have winter - I did Winter on both of these since we end and begin the year with winter - so they're in the correct order on my nails! I used all Elevation Polish polishes (listed below) and acrylic paint to create this mani. I really wish I had gotten a photo of the bases before I added the branches and leaves. I did some pretty complex layering and they had a lot of depth. That was pretty much lost when I added the branches. This was also my first time using Cult Nails Wax That, which I picked up because I saw a few other ladies using it and decided I had to have it. I really like the finish it gives! 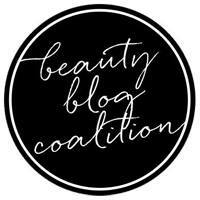 Make sure to check out all the other amazing manis below! Beautiful! And I really love how you did the 4 seasons as you see them because you don't have snow like we do. I think that makes this really special! What a great representation of the seasons! Where I am we don't really get 4 seasons either...just summer and winter. Spring and Fall last a couple weeks at best. 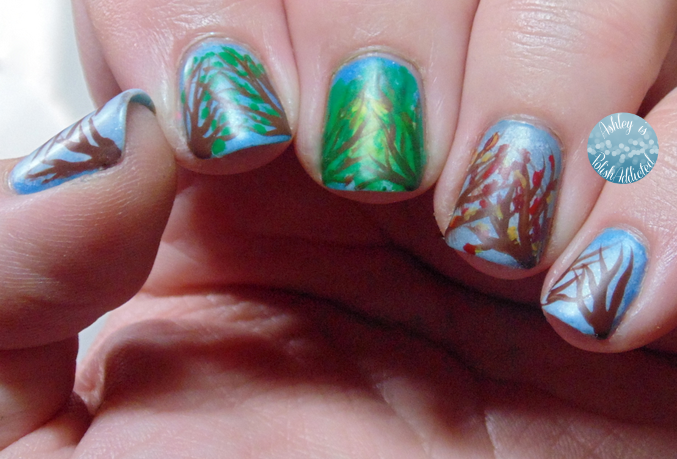 I love that you captured all seasons of nature in the single mani! I love the depth you created with all the different coloured leaves. This looks amazingly beautiful! I wish I could experience all those seasons, and not just summer all year long. What a great idea! Love the different seasons! As someone who lives in this climate, great job! I also love Wax That! I had it untried for a while and now love it. Seasons are overrated!! Lol...I could do with less of some of them! The nails are really nice though! You know I love me some ALL FOUR SEASONS for sure. These are lovely! I love these! I would love to skip the long winter. Can you make that happen? I love this so much! Such a great and creative design!